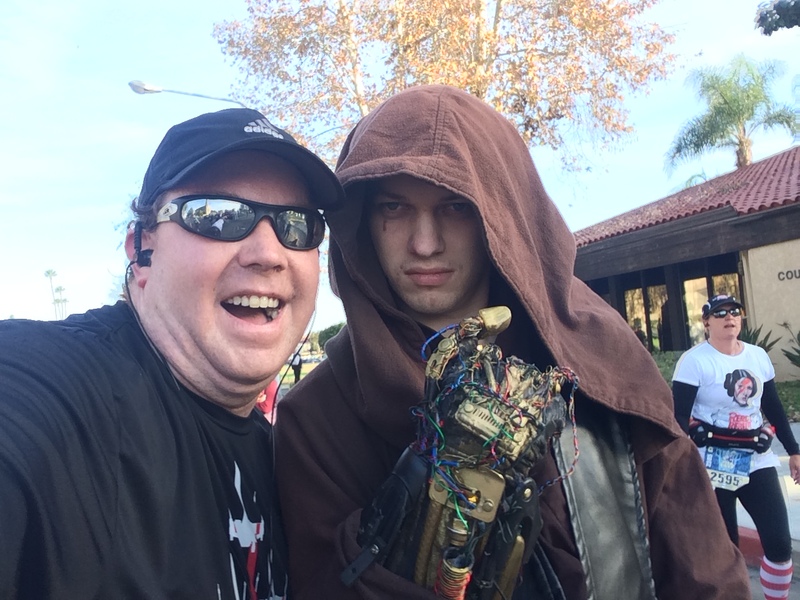 With the Star Wars Dark Side Half Marathon going on this weekend at Walt Disney World, it reminds me that I never got up a race recap for the Star Wars Light Side Half Marathon at Disneyland. So, let’s rectify that. 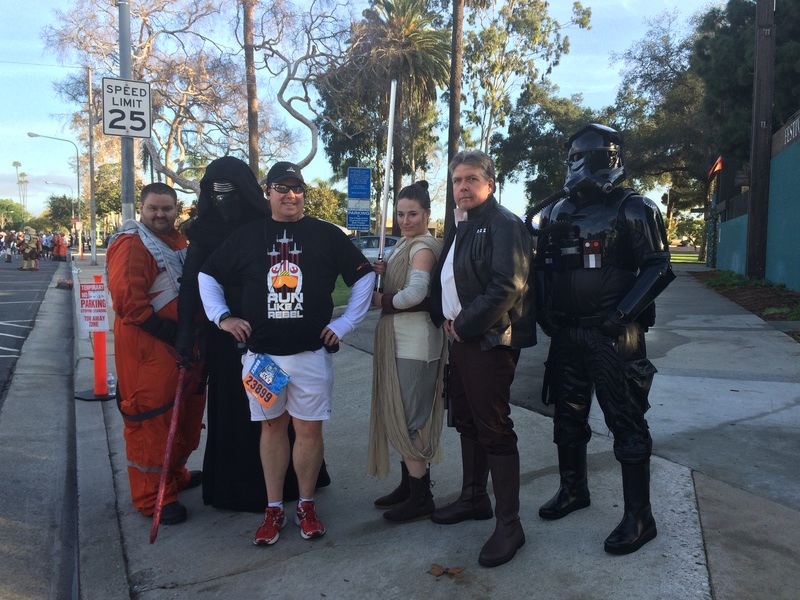 I was up at O’ Dark Hundred hours again to head off to Disneyland to finish the Rebel Challenge. 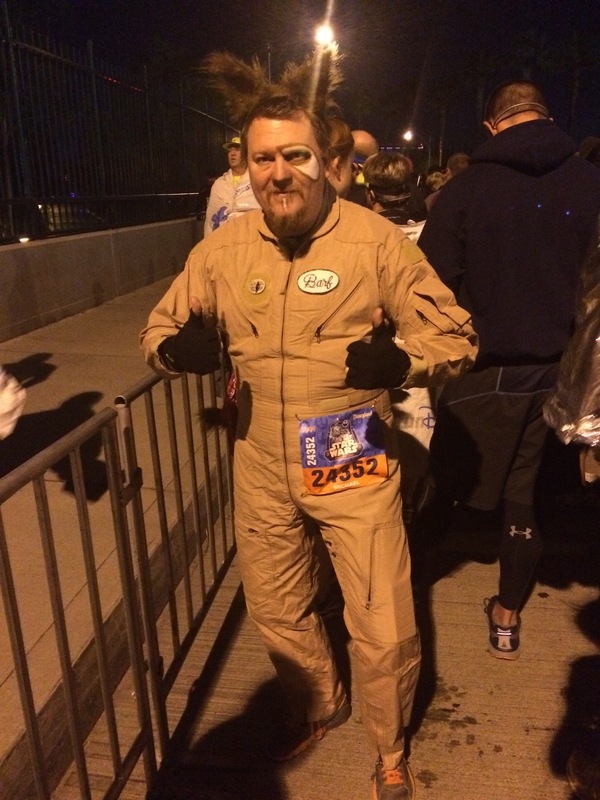 The race costumes were pretty great (yet again) for this race. 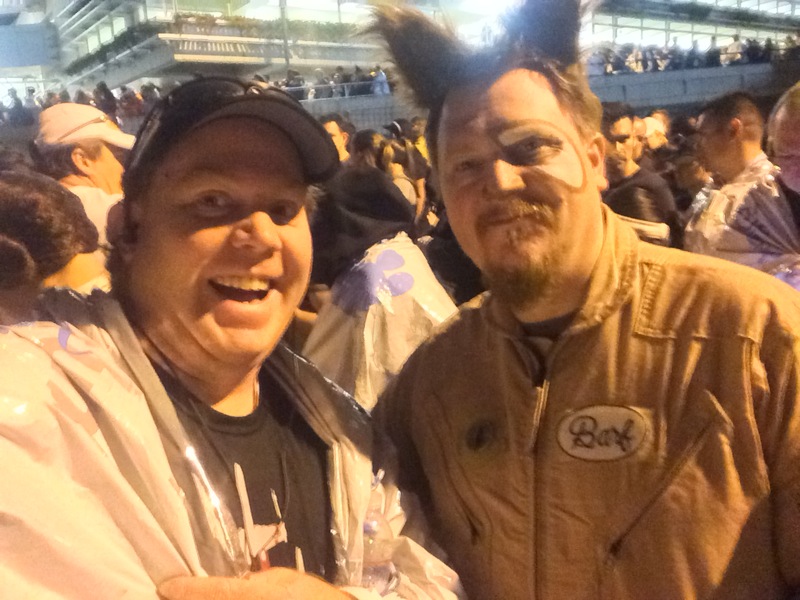 I even ran into Barf from Spaceballs in my corral! He had the full out fit going on! 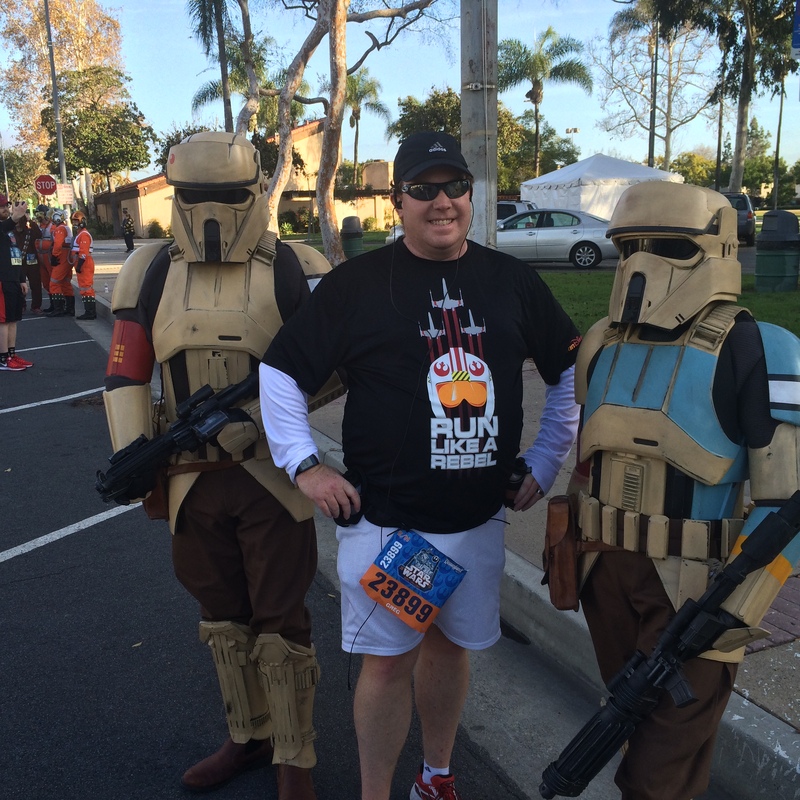 Funny thing…I would see this guy all over the course and we even finished near each other. After a rather long wait, my corral finally got up to the starting line. One thing that is hard about being in the latter corrals is the time you spend waiting in them to run. However, eventually we all get up to the start line and it was time to GOOOOOOOOOOOOOO! 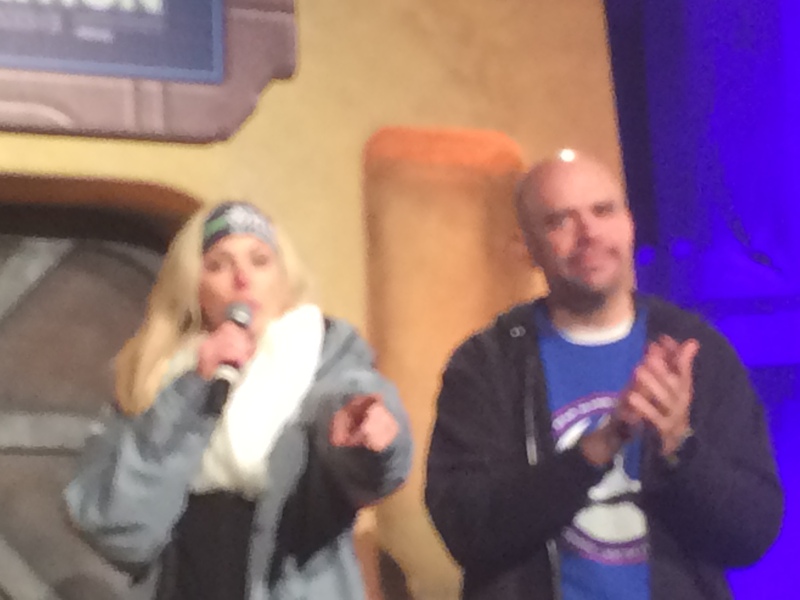 Still missing Rudy at the runDisney races here in Disneyland by the way. Okay, this pic is blurry. But, I got a shout out from Carissa at the start! How cool is that? She remembered my boy “running” in the diaper dash the day before! The great thing about this course is that we get into the theme parks early on. It was pretty much the same route (at the start) as the 10K. I always love running by this part of Radiator Springs. 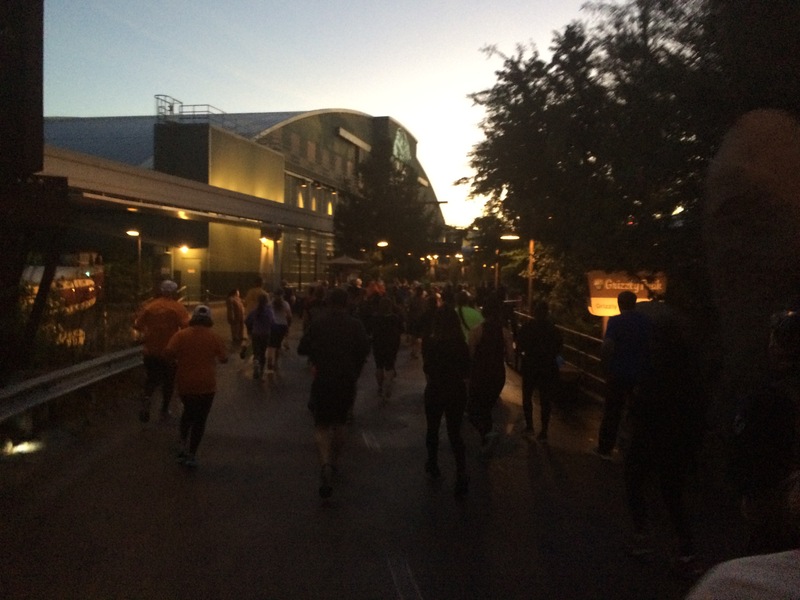 It’s kind of epic to see all the runners running down the DCA Route 66! We made our way through Cars Land and on into It’s A Bug’s Land. As I was making my way through, I thought to myself..hey. You haven’t taken many pics running through this land. So, I had to snap a quick pic. I made my way past the mile 1 marker and on towards Paradise Bay. The early time of arrival here meant that we got to see the World of Color fountains all lit up! 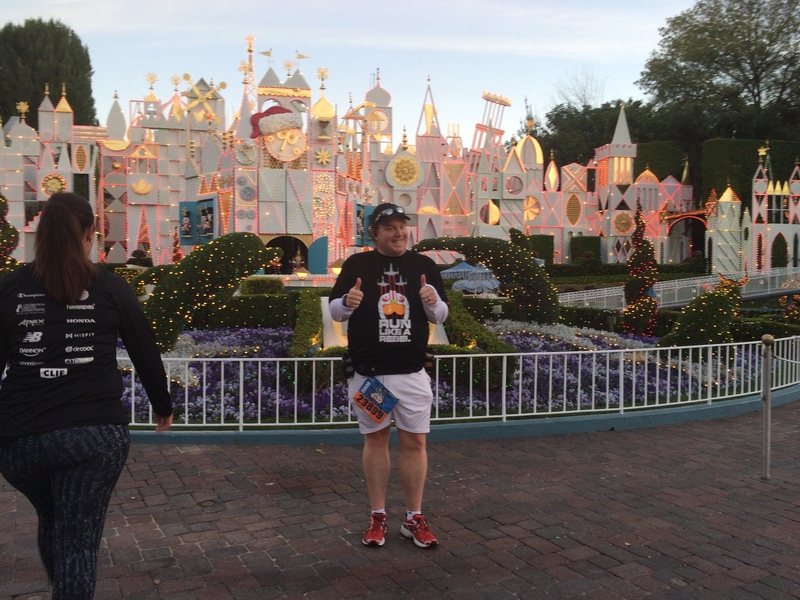 I think runDisney should start all of their races the say way as this route went. This way, we’d all be shortly into mile 2 by the time we arrived here! We made our way up and around the Paradise Pier section of DCA. 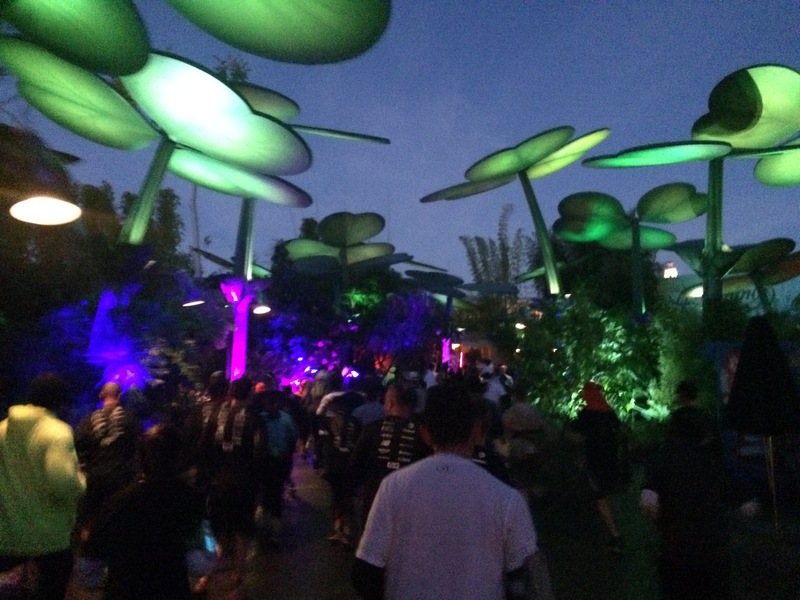 It was lots of fun run/walking my way through this section with all the lights going! I should mention that, for most of the race, I did a run 30 seconds, walk 90 seconds. It worked out fabulously. Especially since I didn’t have any time goals in mind. Much like the day before, we wrapped around Paradise Bay up to The Little Mermaid ride. Then, ran through the Grizzly River Creek area to the Condor Flats. 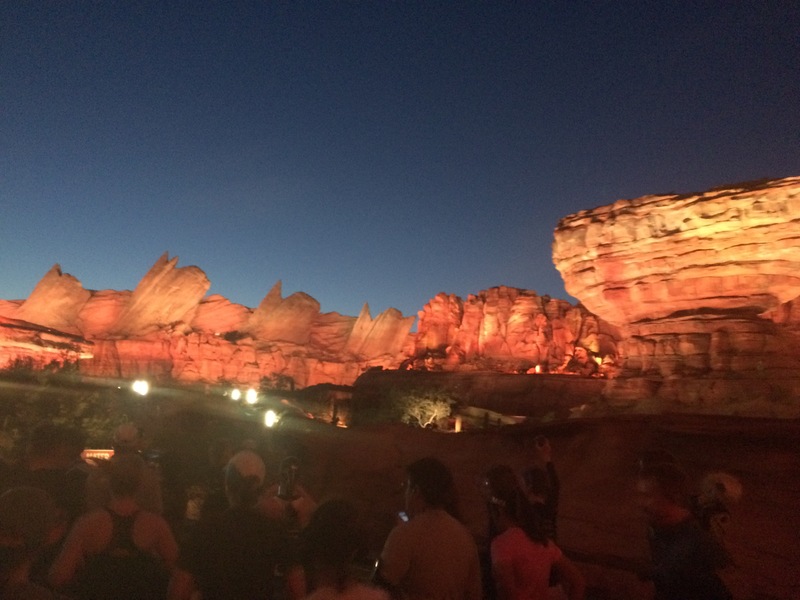 Much like It’s A Bug’s Land, I hadn’t ever taken a pic running through Condor Flats. So, I took advantage of a walk break and got one this time. 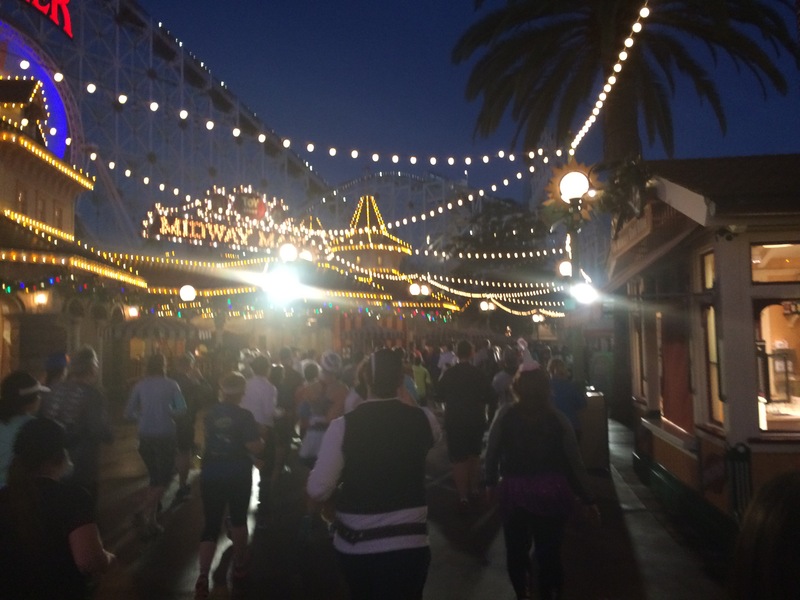 We ran through Condor Flats, across Buena Vista Street and onto the Hollywood Land area. For me, this is the Main Street U.S.A. of DCA. In the dark it’s all lit up just like Main Street U.S.A. So, I try to get a pic running up here every time I do. 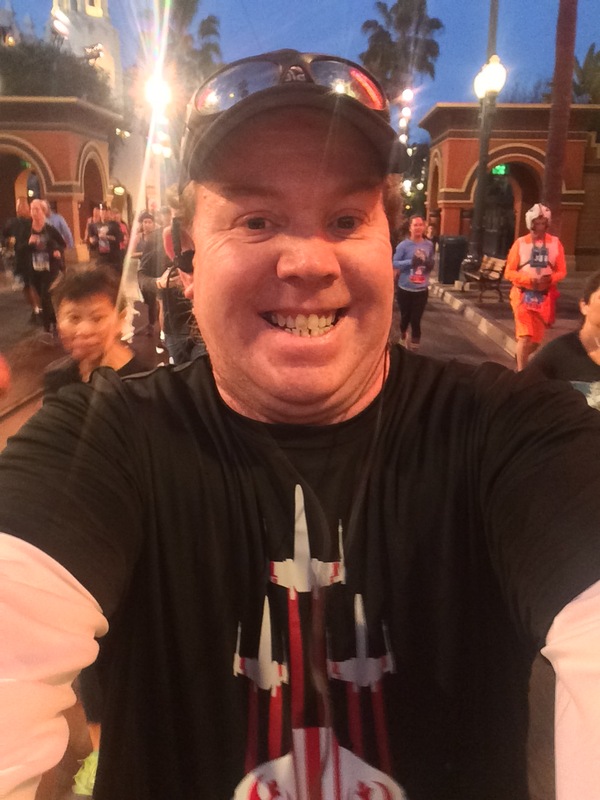 We got to the mile 2 marker right around the former Tower of Terror. It was all wrapped up when we ran by. 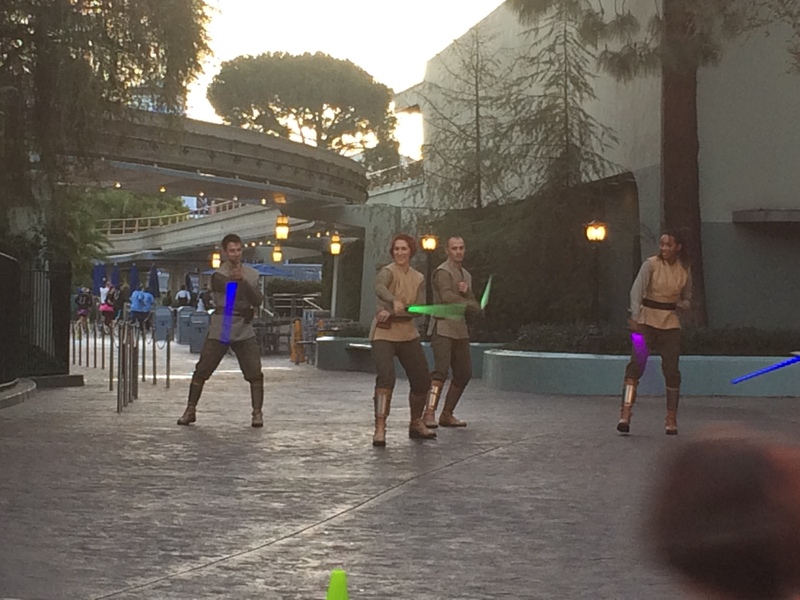 Next time I run by that area, it will be themed to Guardians of the Galaxy. I knew that mile 3 was primarily backstage. So, I focused on the run/walk intervals here. The goal of a fun race like this is to pick your spots where the running is of major importance and where it isn’t. 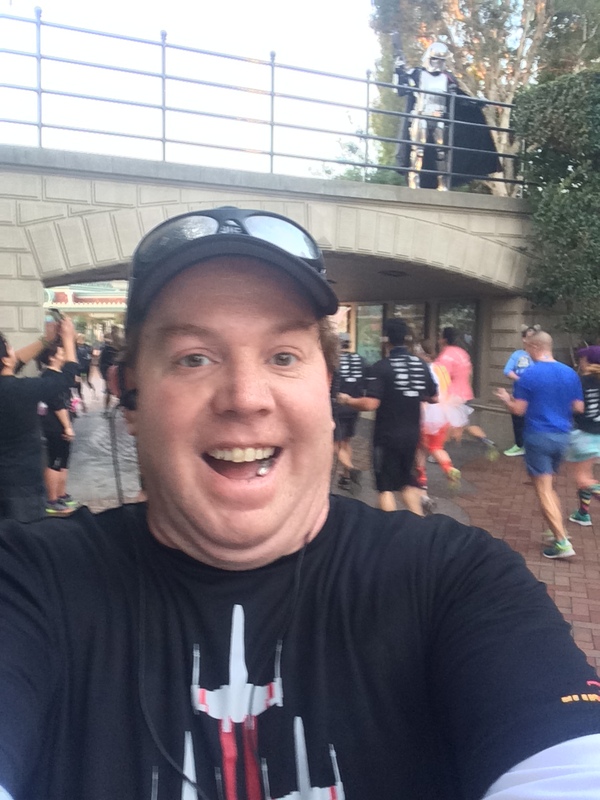 I knew that running inside the theme parks makes you a little slower. 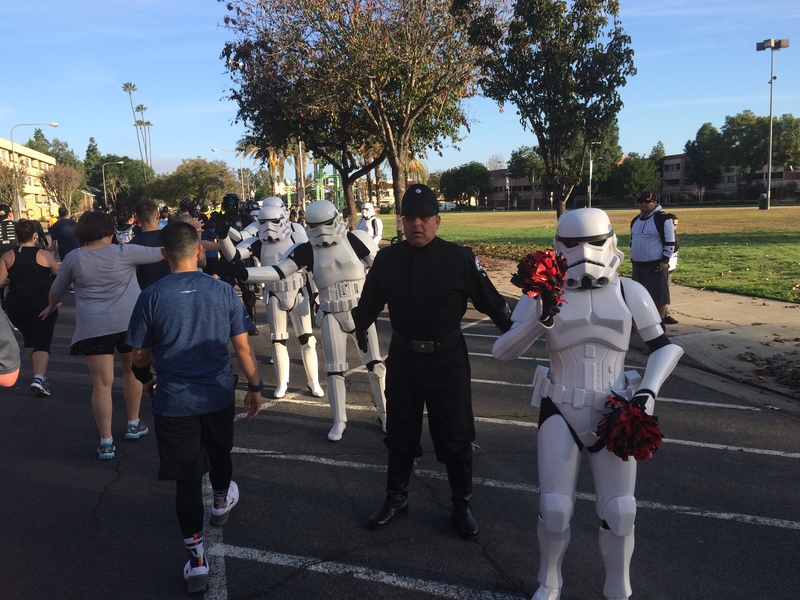 In this race, we’d have the party with the Cos Players and the 501st Legion in miles 8 and 9. 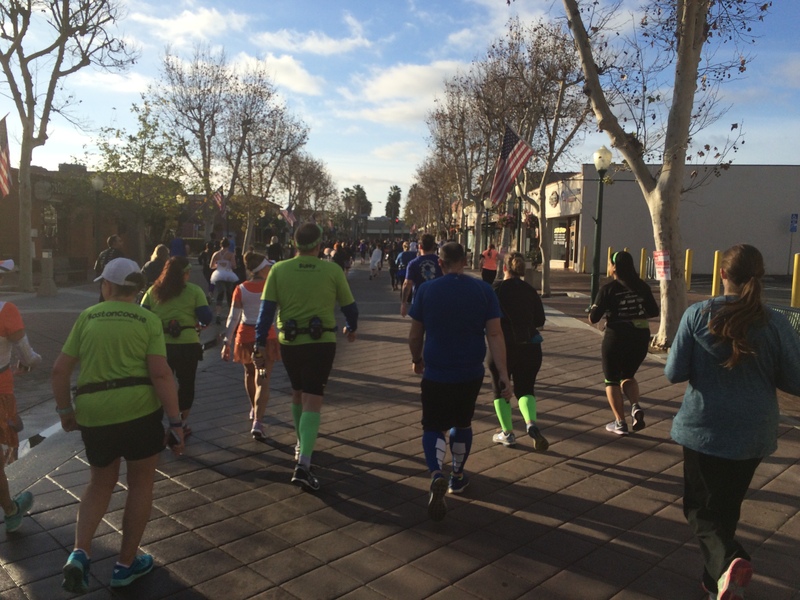 So, I wanted a really good mile 3 and start to mile 4. We made our way on-stage in Toontown, making our way towards It’s A Small World. The sun was starting to get brighter. So, I didn’t know how this pic would turn out. The lights for the holiday version of It’s A Small World were on and I could see them pretty well. By the way…don’t you love how my bib is barely hanging on? One side broke right before I started the race. Yep. 13.1 miles of me hoping I wouldn’t loose my bib. We ran from It’s A Small World and by the Matterhorn on our way to Tomorrowland. Then, we ran up Tomorowland towards Main Street U.S.A. It was a quick stop on Main Street U.S.A. before we headed back past the other side of the Matterhorn on our way into Fantasyland. If you lok at this picture, you see those who were behind me running into Tomorrowland by the Nemo Subs. 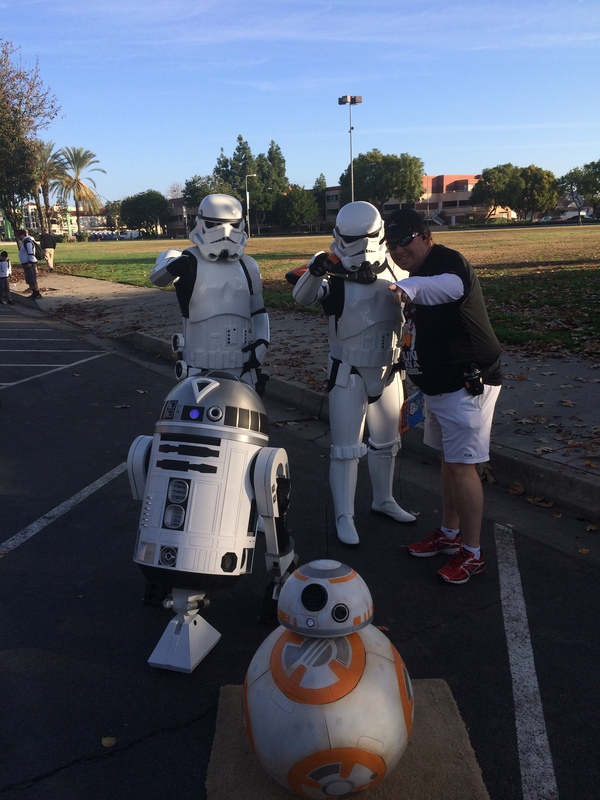 It was really fun to have some Padawan Jedi’s training while we were running! We wrapped around Fantasyland and through Sleeping Beauty’s Castle and up Main Street U.S.A. 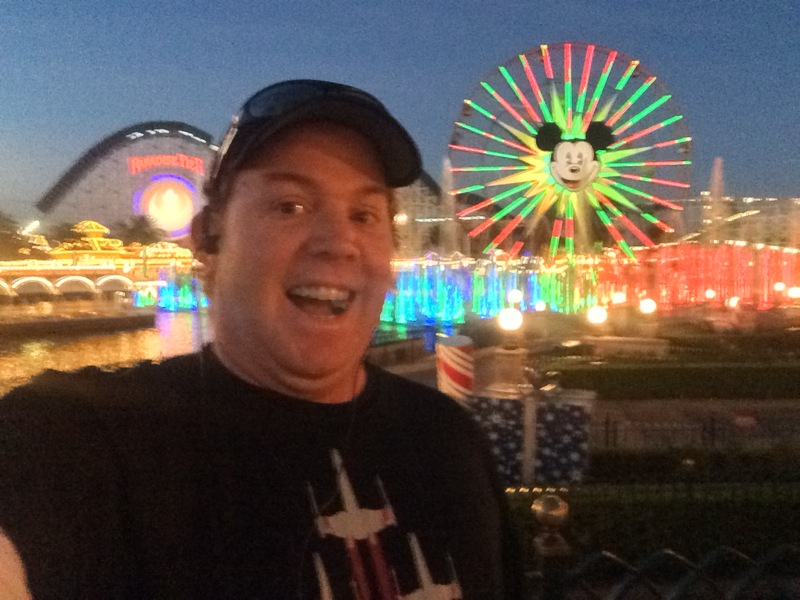 I couldn’t resist the temptation for a quick selfie with the Partner’s Statue and Sleeping Beauty’s Castle in the background on my way to Main Street U.S.A. 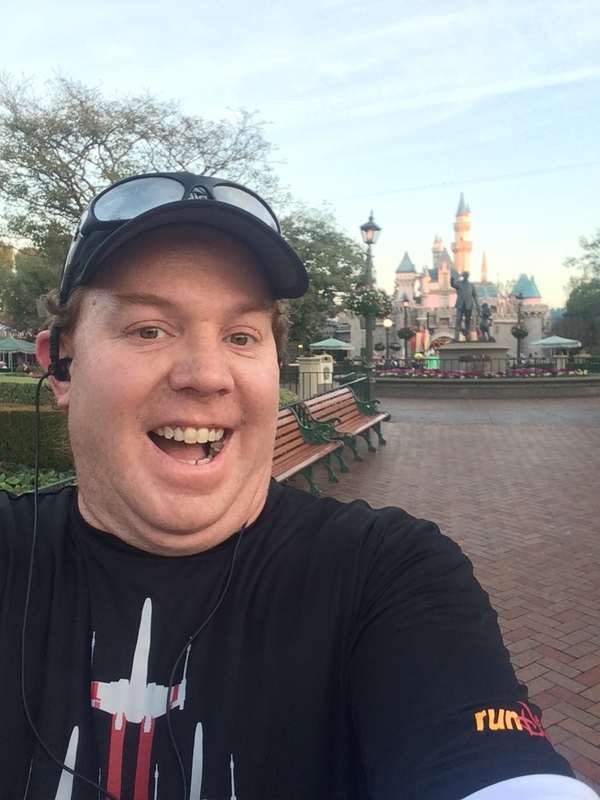 Since a run interval was coming up, I had to grab this selfie really quickly after my previous spot. After all, we run down 2 Main Streets on this course. Main Street U.S.A. was just the first one. As we got close to the Main Street Train Station, I saw the line for Chewbacca. 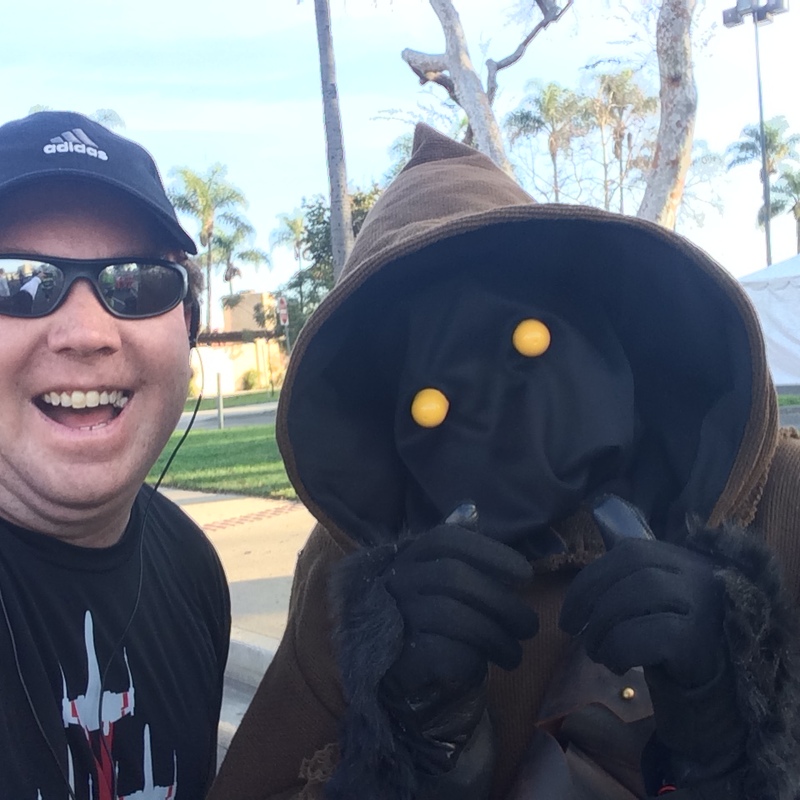 I didn’t want to get in line for pics with characters in the parks. 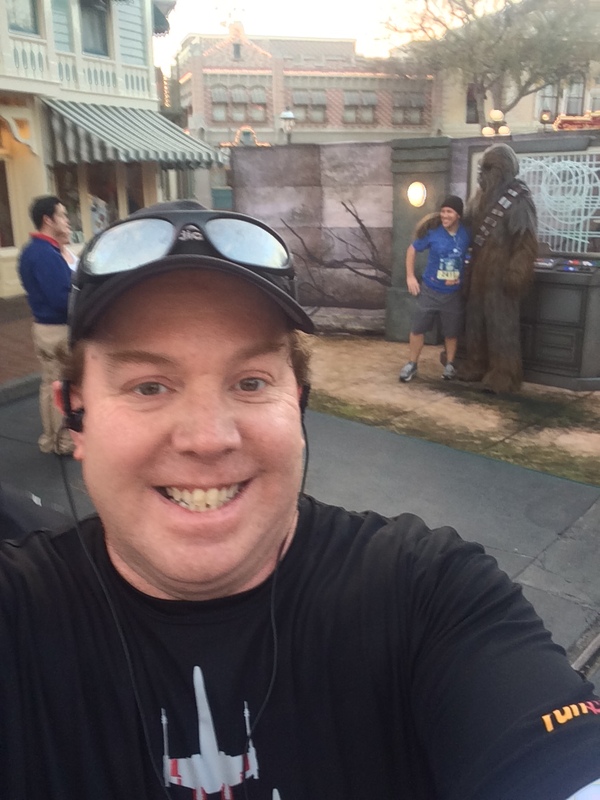 Since I didn’t see Chewbacca during the 10K, I stopped for a quick selfie. 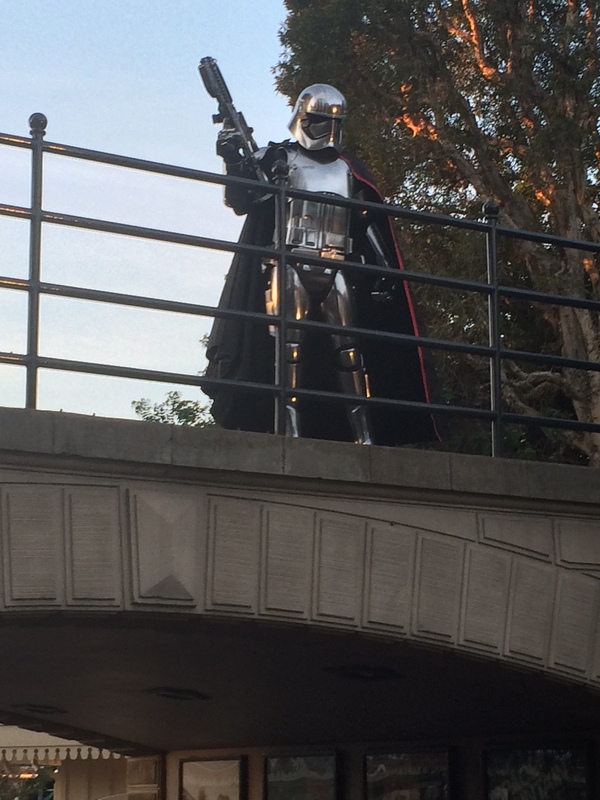 Just like the day before, Captain Phasma was roaming the Main Street Train Station. 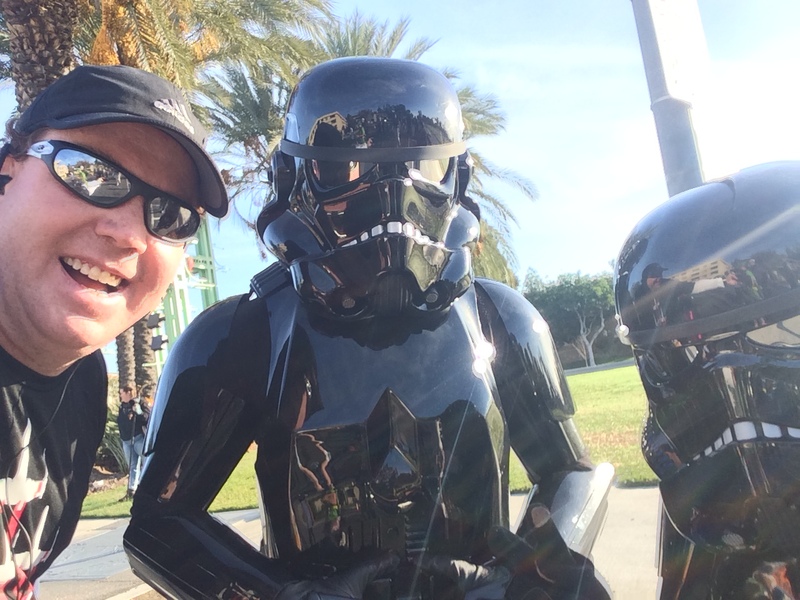 Wouldn’t it be great if Captain Phasma was more of a regular at Disneyland? We ran out of the entrance at Disneyland and through the Bus Stops area to get to Harbor Blvd. This year, the lane to get through the bag check area was larger than the year before. Good job Disney! Once I got on the streets, it was really time to focus on maintaining my run/walk intervals. 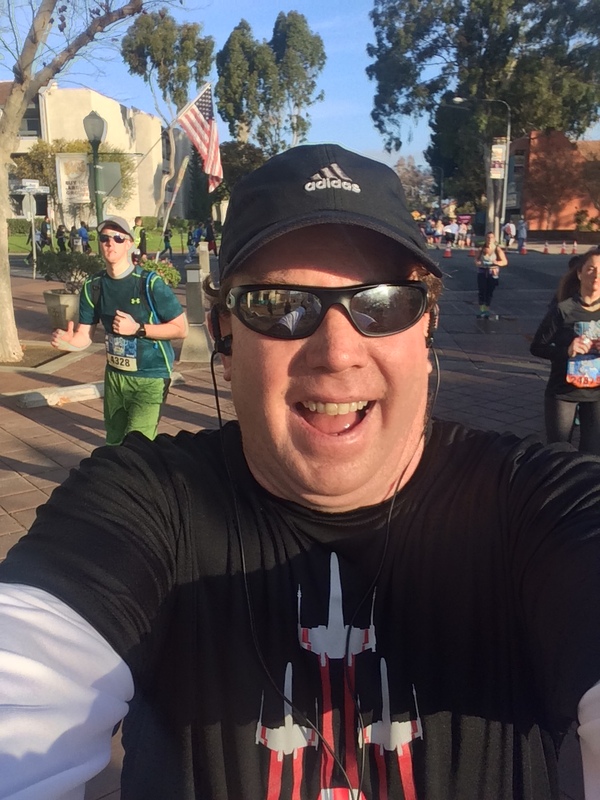 I was really happy with how the run/walk intervals felt all the way down Harbor Blvd. and beyond! I felt really good the whole way. 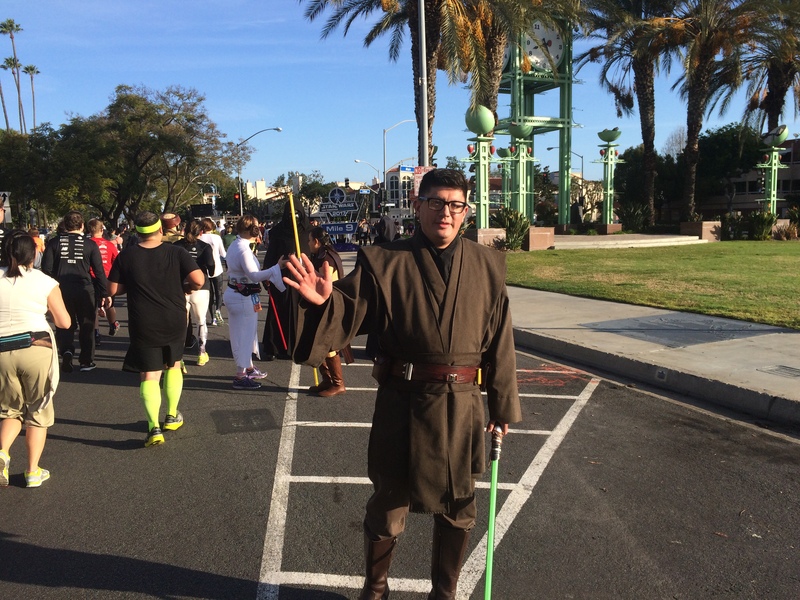 Towards the end of mile 7 I was ready for the Cos Players. Looking for them made for a nice distraction. Then, we got to the park where they were all lined up! 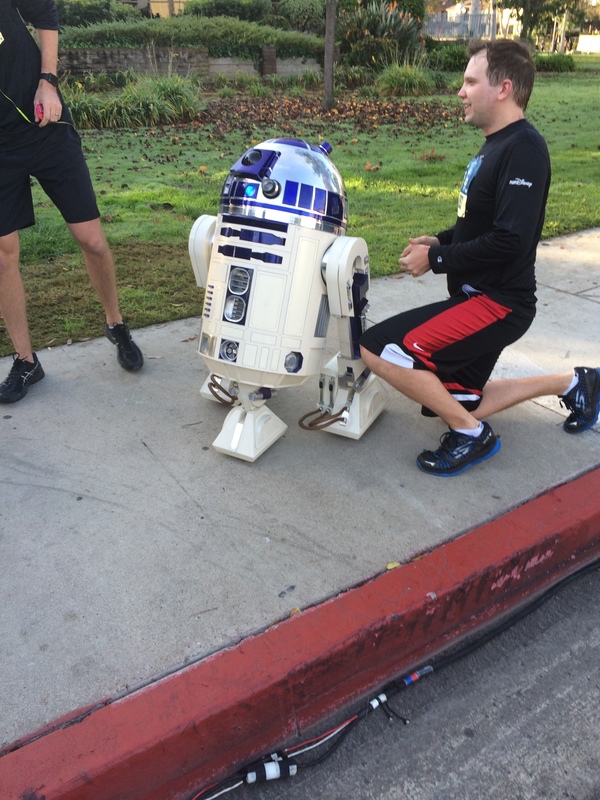 Loved this R2-D2! 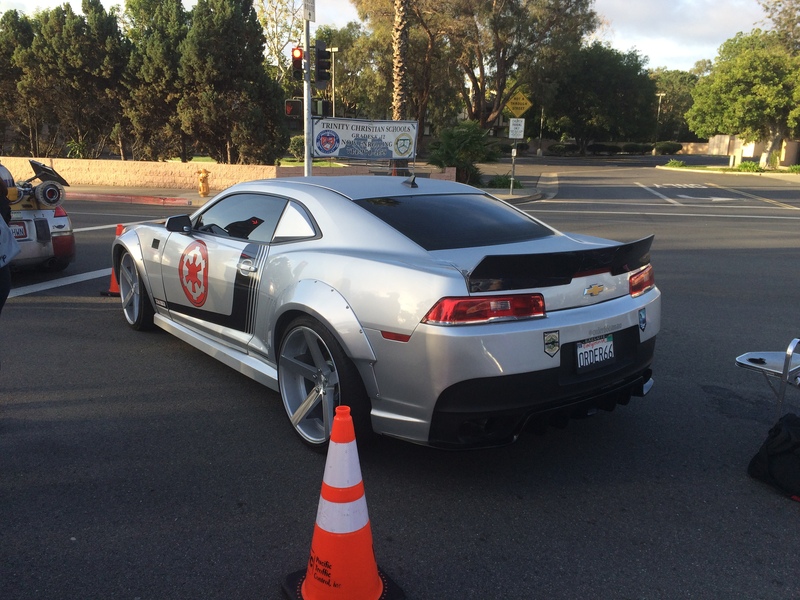 I’m not sure what kind of Storm Trooper this was. However, he was pretty cool! 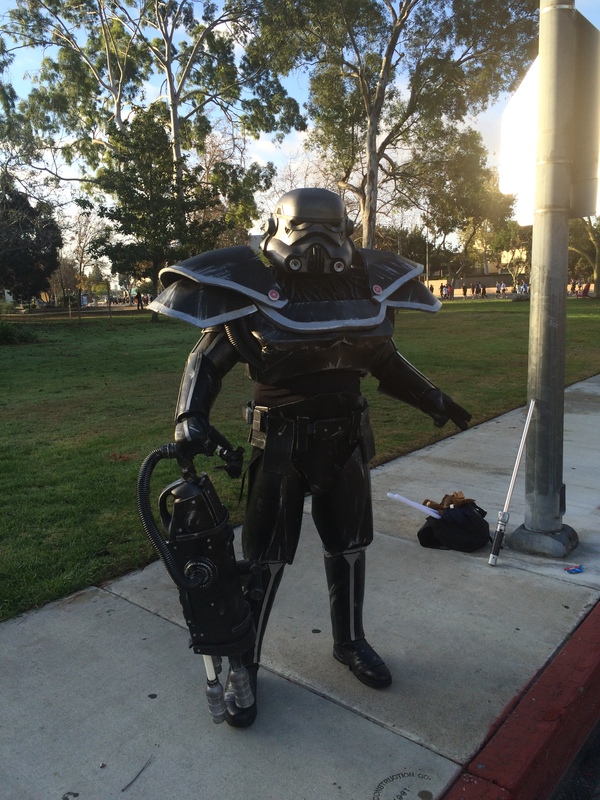 I’m guessing this guy was from the Clone Wars animated TV series. Maybe an Obi-Wan? 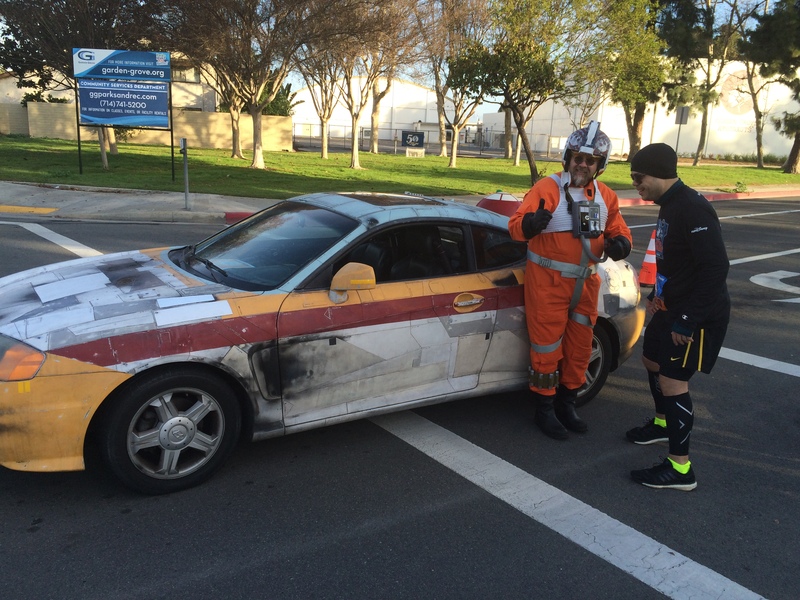 As we turned the corner to start mile 9, there were some pretty cool Star Wars themed cars! 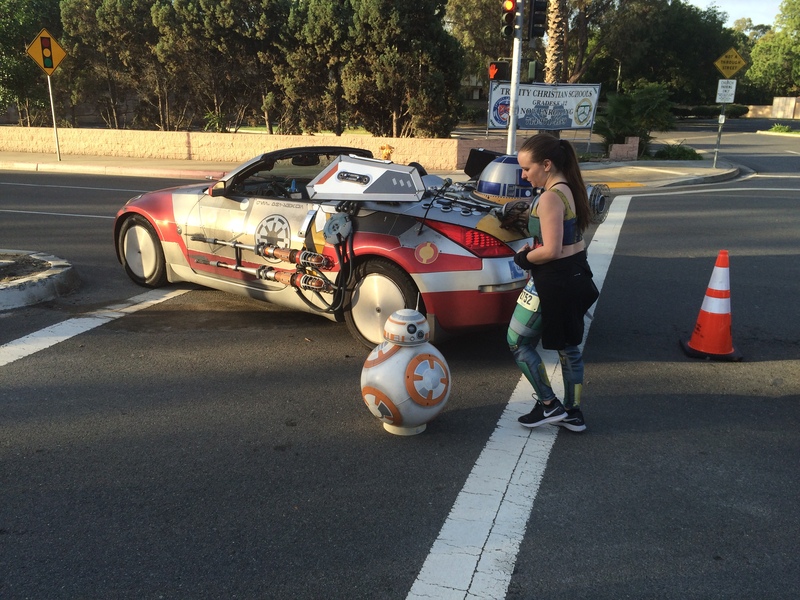 This one even had a little BB-8 droid and R2-D2! Not too far past the Cos Players, we got to the second Main Street of this route. This one was Main Street in Garden Grove! It’s not quite Main Street U.S.A., but it’s still pretty cool! 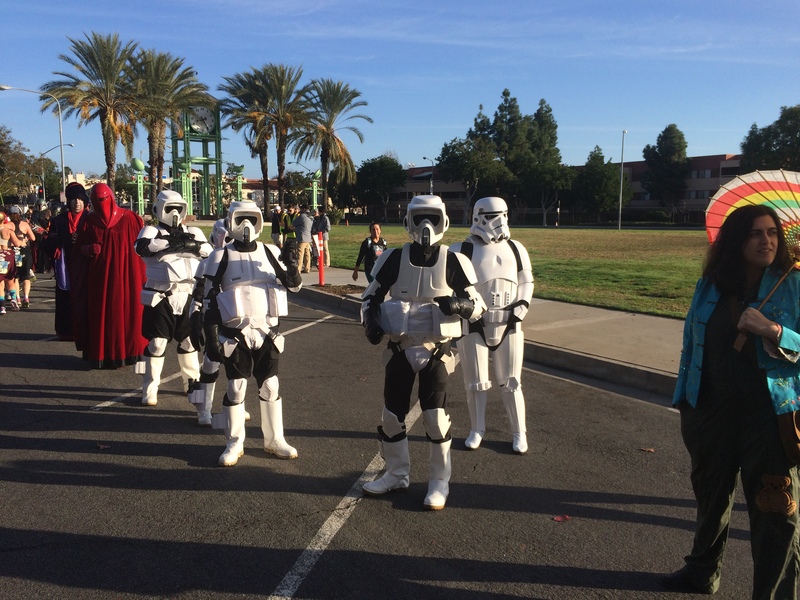 Then, before I knew it, we were on to see the 501st Legion folks! They always make this race so much fun. 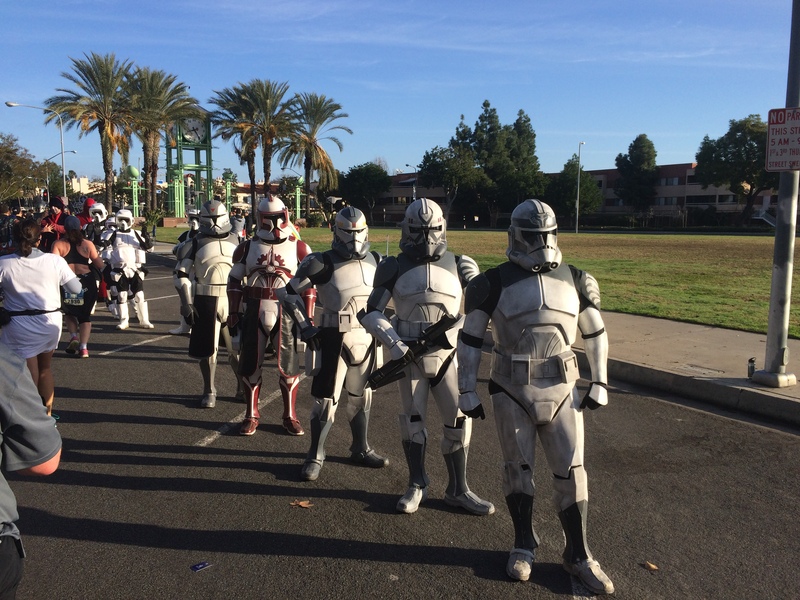 In each of the previous 2 years, the 501st area starts off with a good size group. 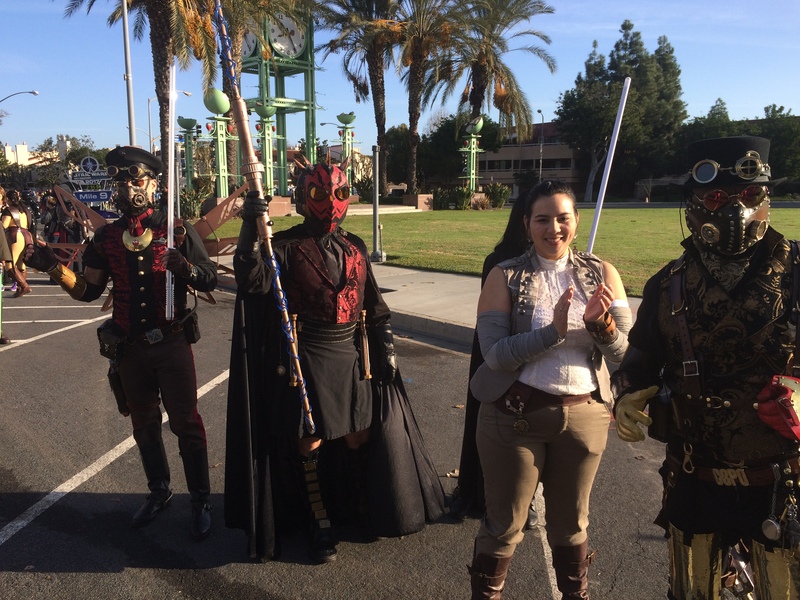 This year, we had an X-Wing pilot, Kylo Ren, Rey, Old Han Solo, and a Tie Fighter Pilot. Anakin Skywalker! Love the mechanical hand! This may have been the Star Wars Light Side of the force. 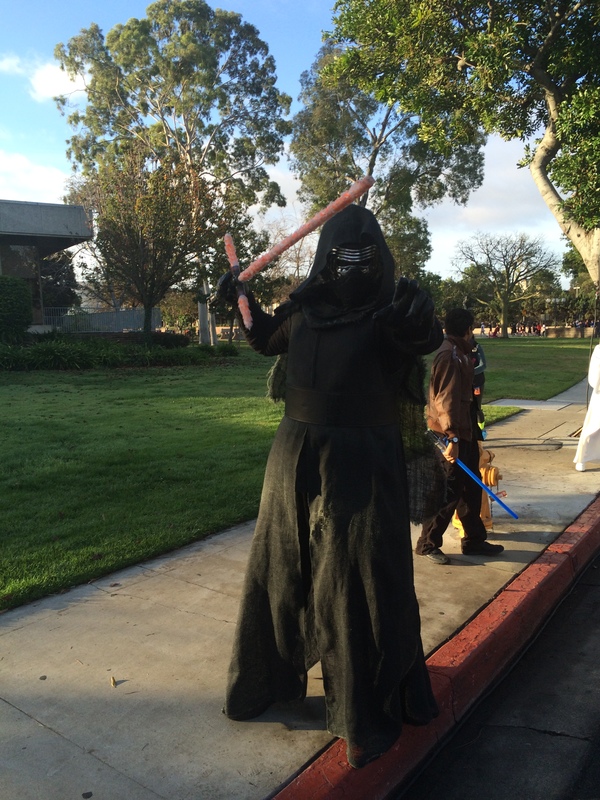 But the dark side was well represented. 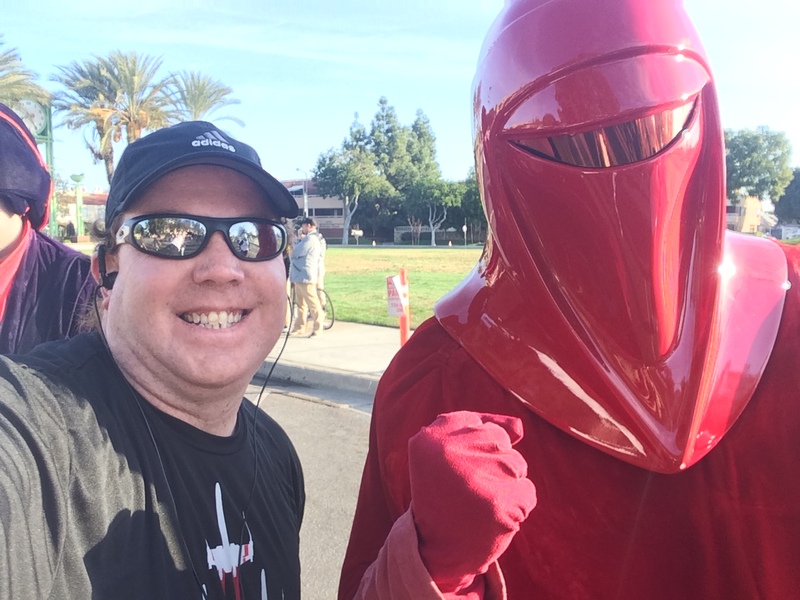 At least they were cheering us on instead of calling us Rebel Scum. Look! 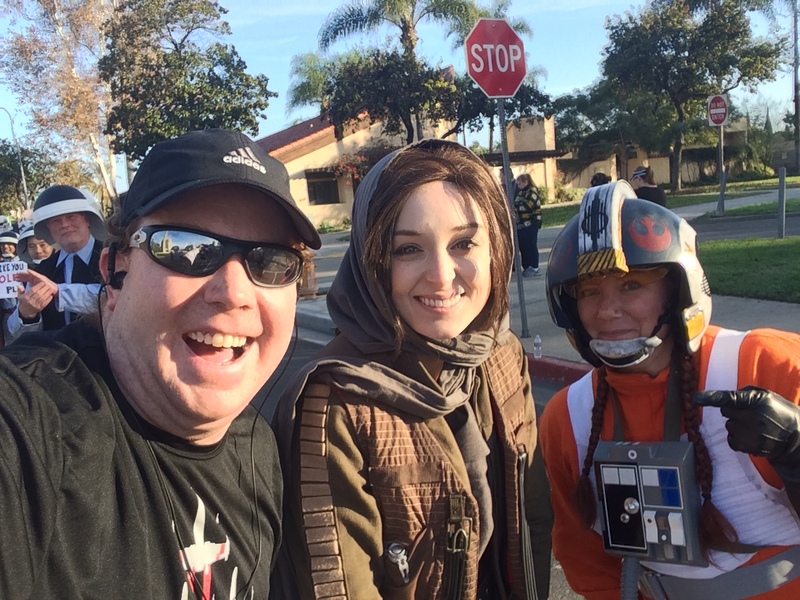 Another Tie Fighter Pilot! Clone Troopers. 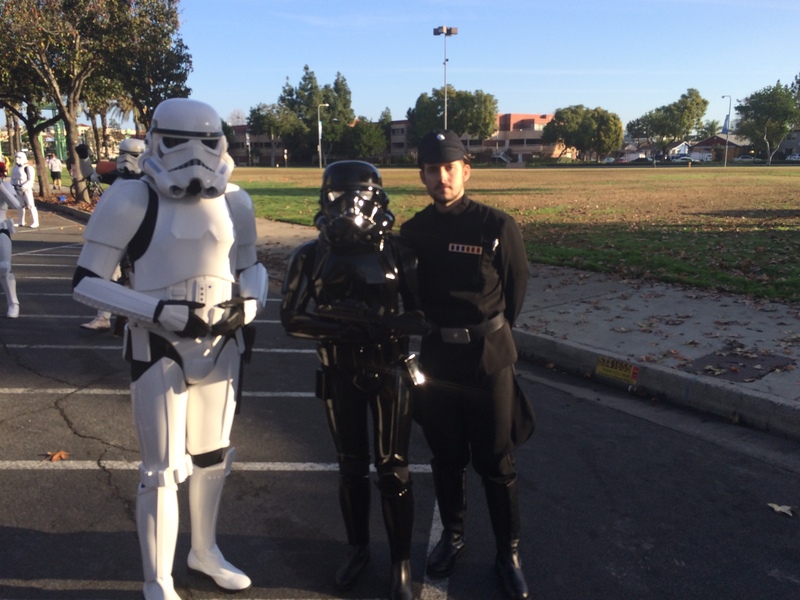 These guys are both Light Side and Dark Side. 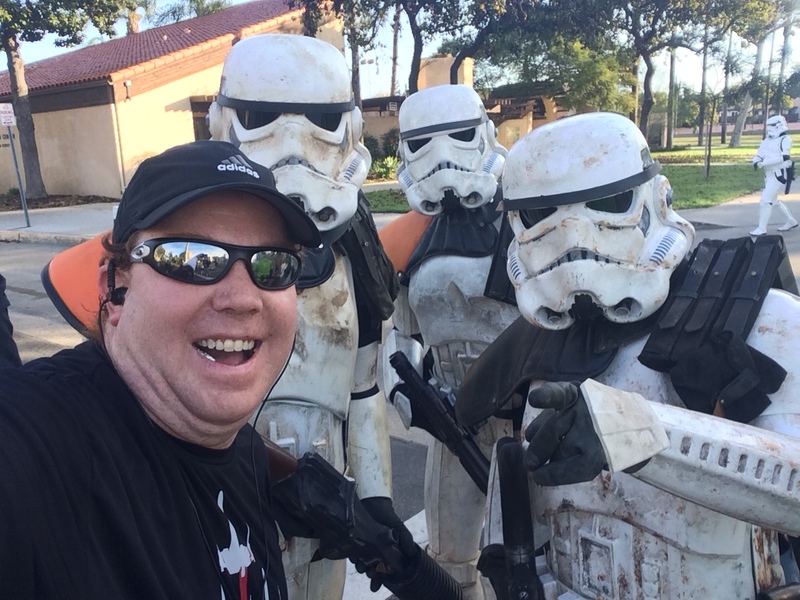 I think every type of Storm Trooper imaginable was represented. I think these guys were some sort of mash up. By the way, see the Mile 10 marker? I did. Finally! 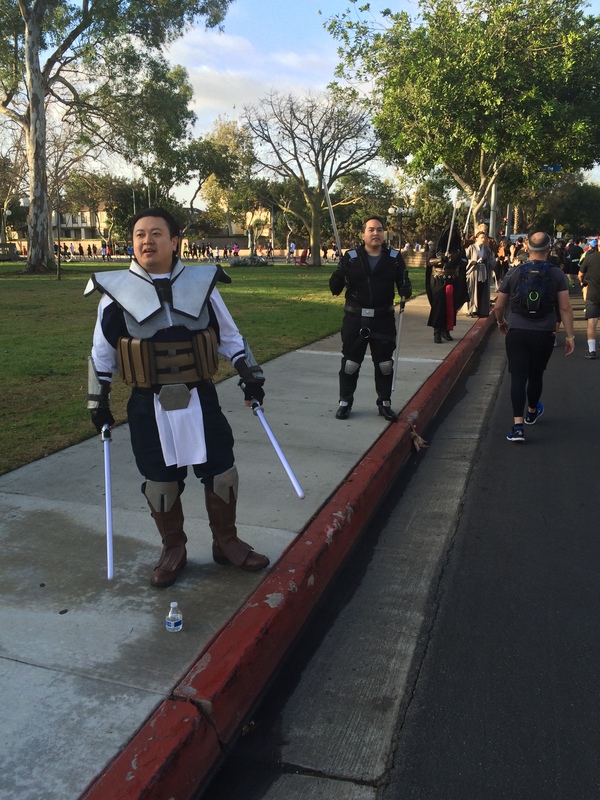 Some Jedi at the end of the line! 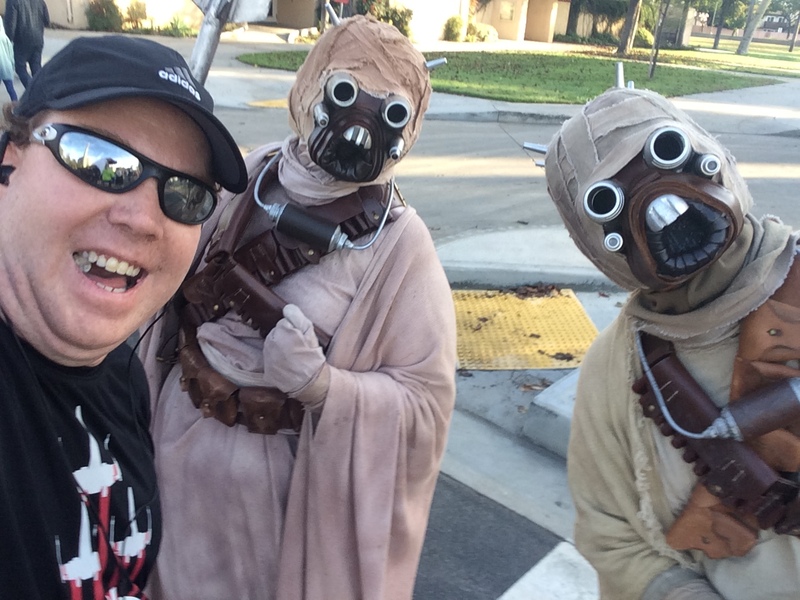 I got a pic of these guys in the Inaugural Star Wars Half Marathon! 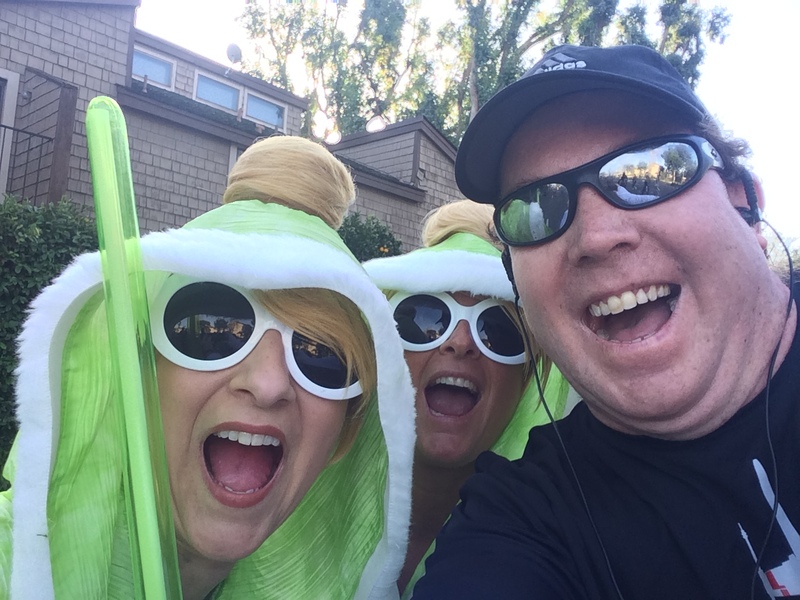 In mile 11, I even ran into Kim and Gail. 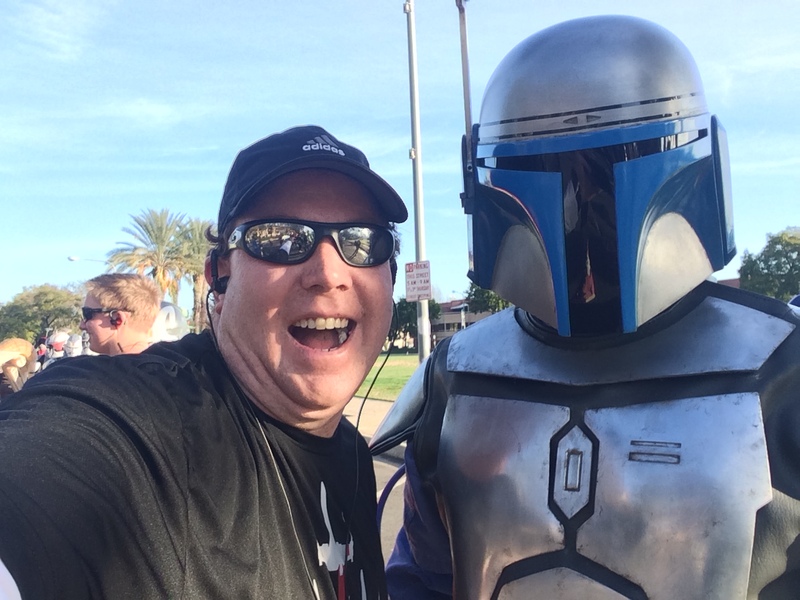 It’s always fun to run into running friends at the races! The excitement from mile 8 and 9 carried all the way until mile 11. 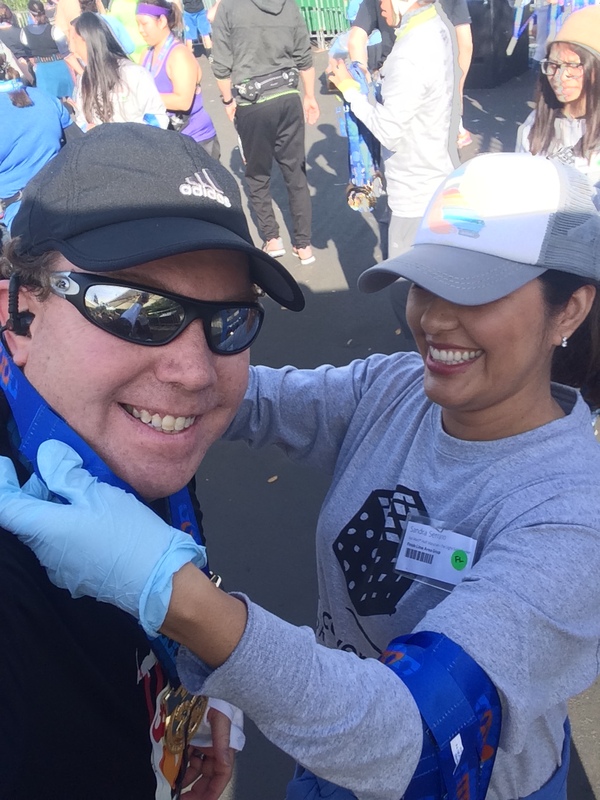 Due to my 11 mile run on January 1st, I was a little nervous as I got toward the end of mile 11. Would I have that same twinge. Or would I be able to continue run/walking? Well, it was all good! 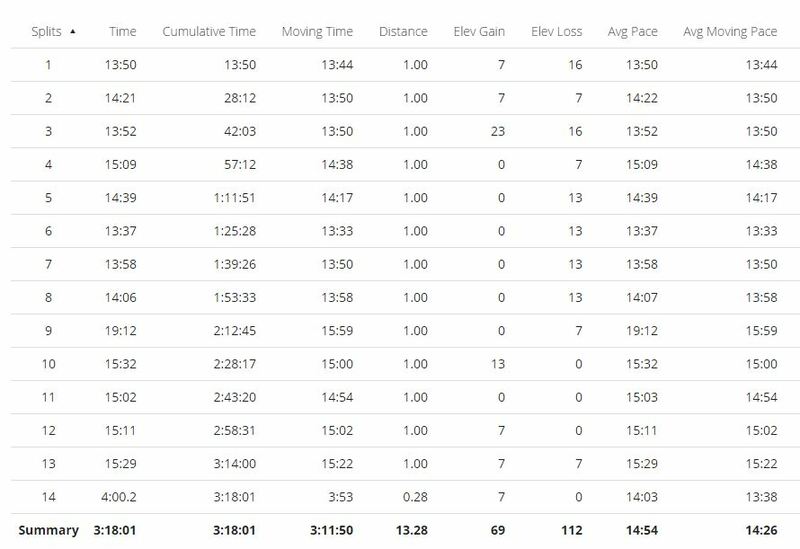 I did tire out a little in mile 12 and skipped a couple run intervals. Since time was unimportant to me, it was okay to do so. 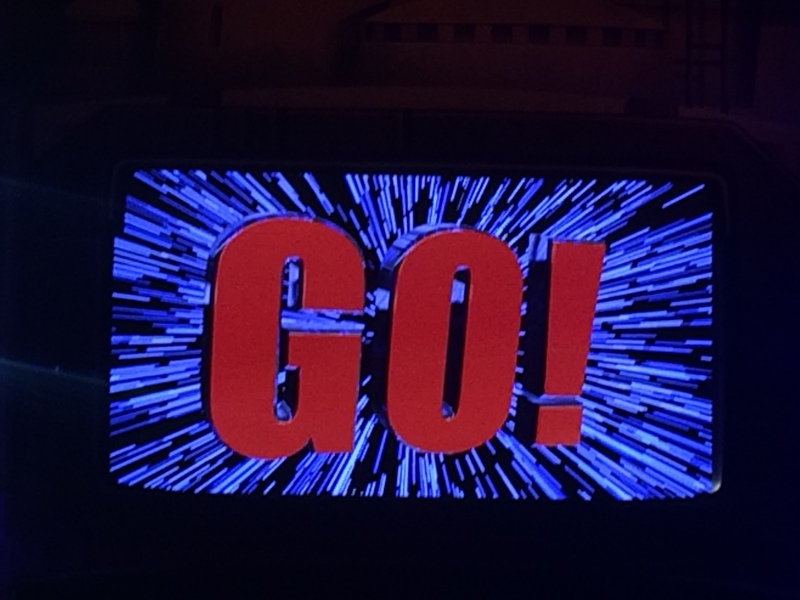 As we got closer to Disneyland, I could feel that finish line calling. In mile 13, it got really emotional for me. 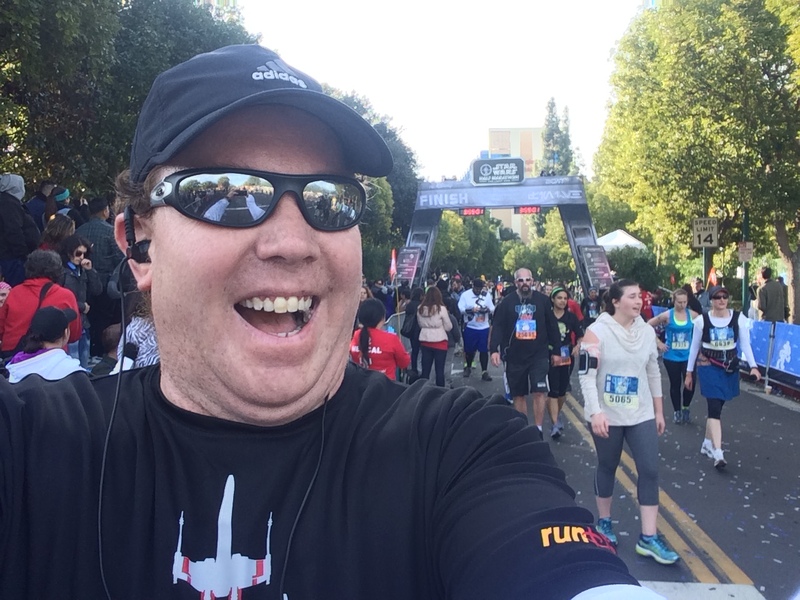 I was about to finish my first 19.3 mile challenge as a dad! Even with a bad finish time, I was still going to finish. I thought a lot about my boy in mile 13. 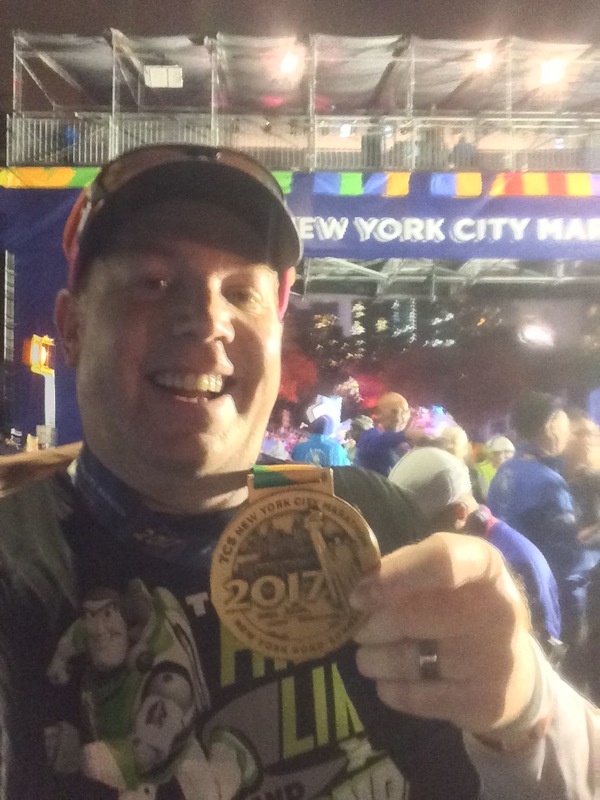 I thought about what I could say to him after finishing. I could tell him that, even with a little guy at home, you can run long distances. You can do hard things and have fun doing them. I can’t wait to share with him my running experiences when he can understand what I’m saying. I’m not going to lie. I teared up a little as we ran up Katella Avenue. I love running up that street anyways because of all the palm trees. 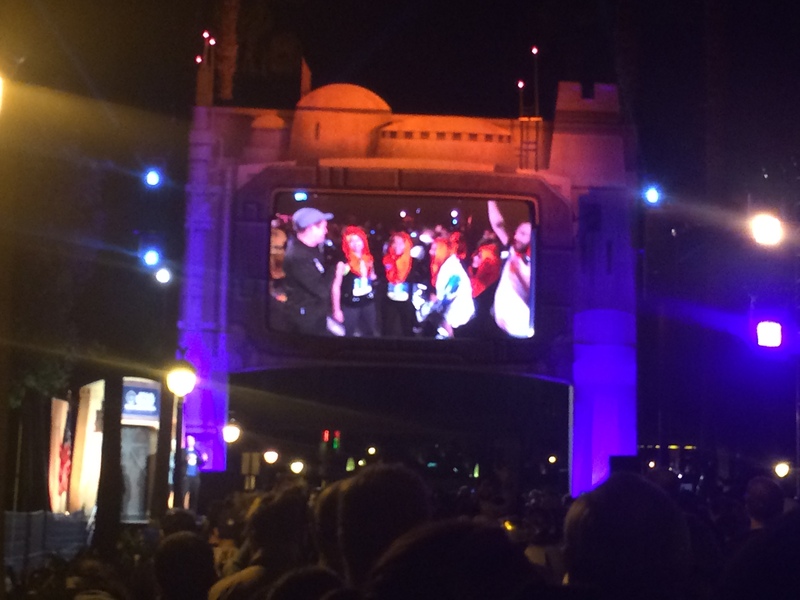 When we turned into the parking lot of the Paradise Pier Hotel, the crowds started building. I love running through that parking lot because they usually have 2 bands/cheer squads. It’s just enough to keep you going until you enter the crowds leading up to that 13 mile marker. Then, before you know it, you’re crossing the finish line! 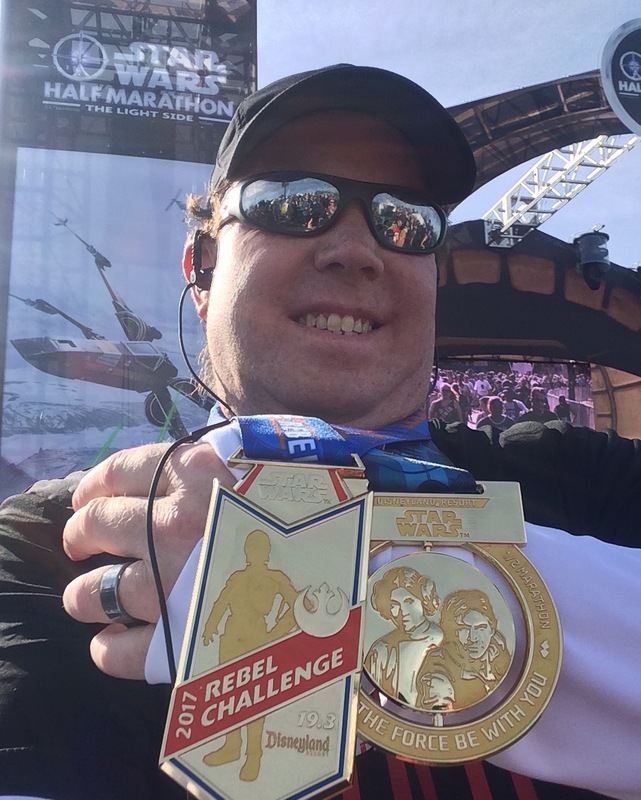 and the Rebel Challenge Medal! 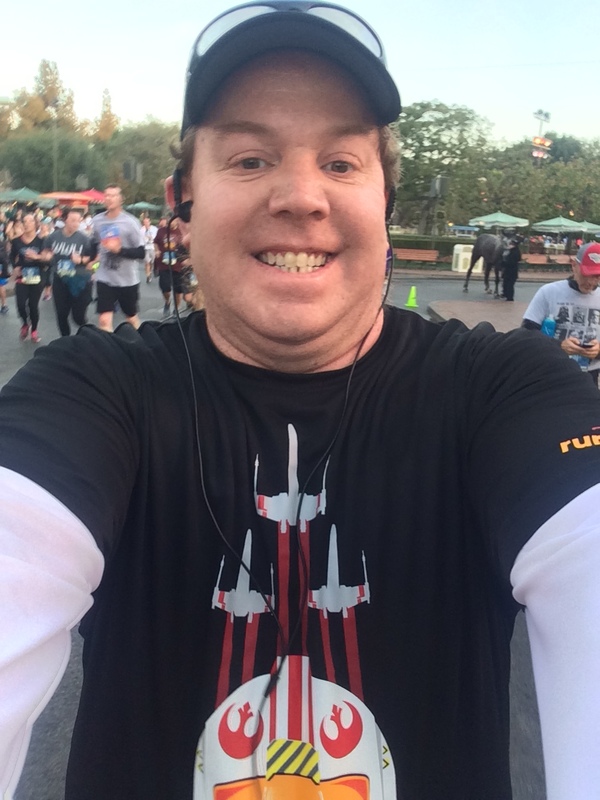 Star Wars Rebel Challenge Number 3 is in the books! Here are the splits for the race. It was a slow finish time. But, this race was all about having fun. 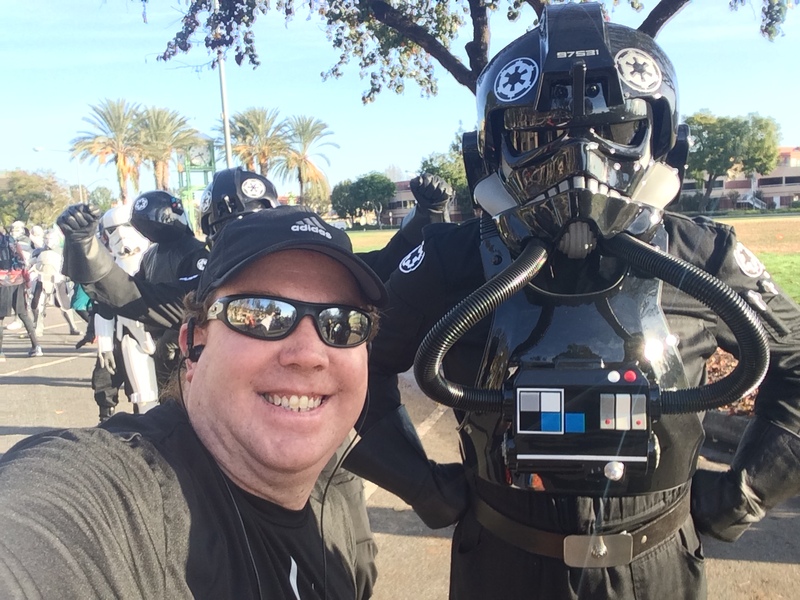 If you’re a Star Wars fan out there and want to run a half marathon, I highly recommend the Star Wars Half Marathon at Disneyland! I mean, look at the medals up close! 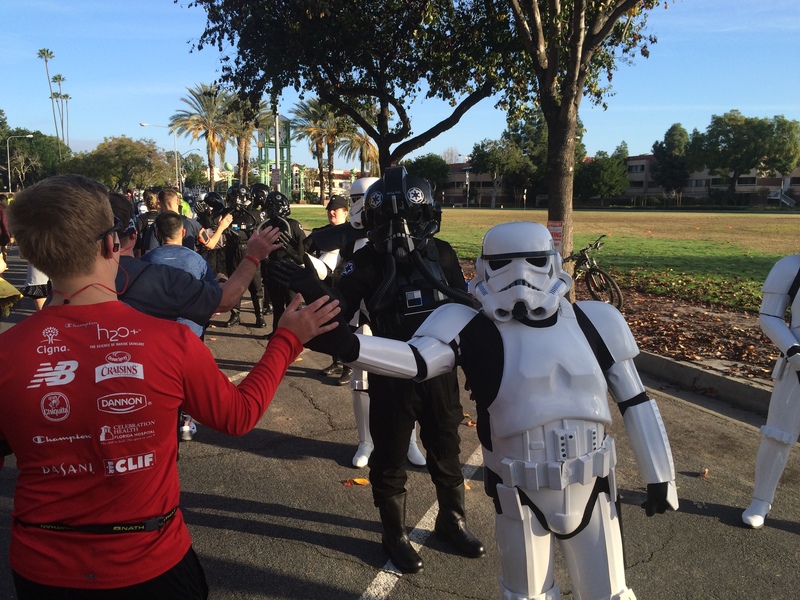 This race is one to seriously geek out over. 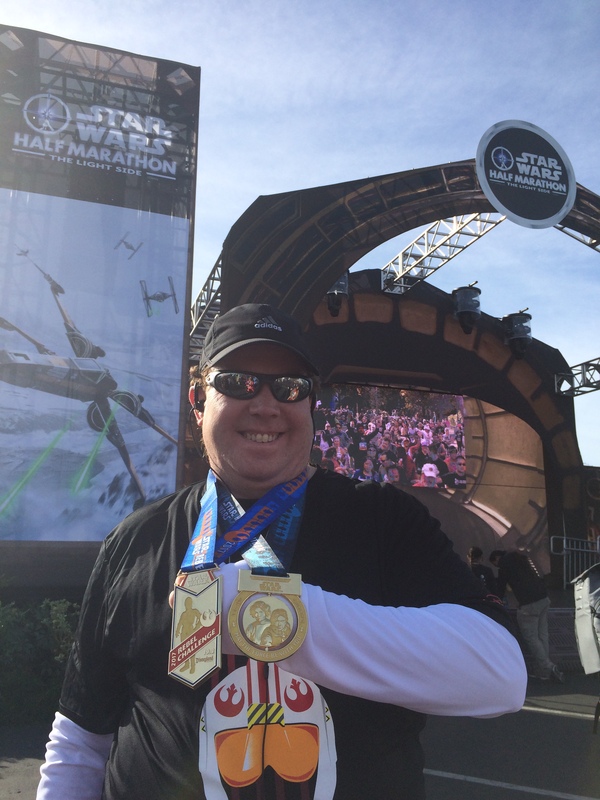 I’m hopeful that I can run this race every single year because it’s my favorite runDisney race on the calendar. 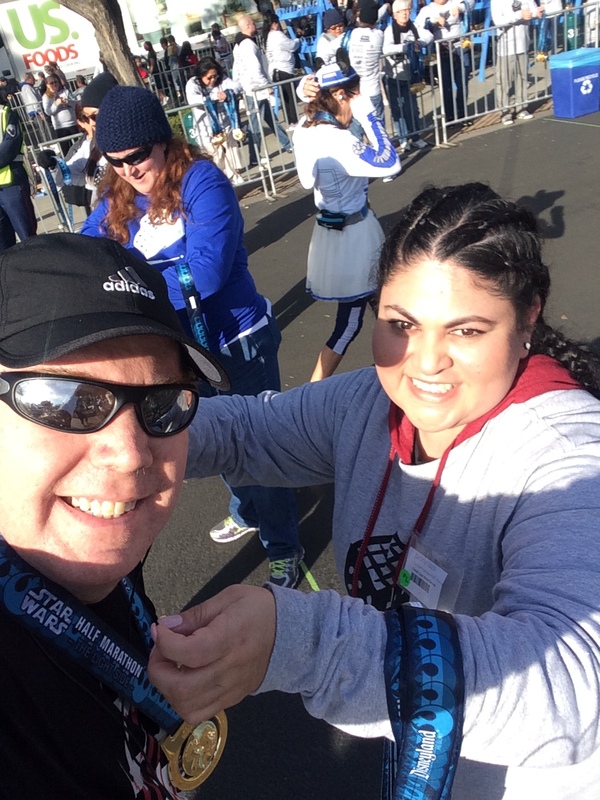 On Wednesday, I’ll do a “Wordless Wednesday” with pics I took with my race medals around the Disneyland Resort after the race. So, be on the lookout for those next week. 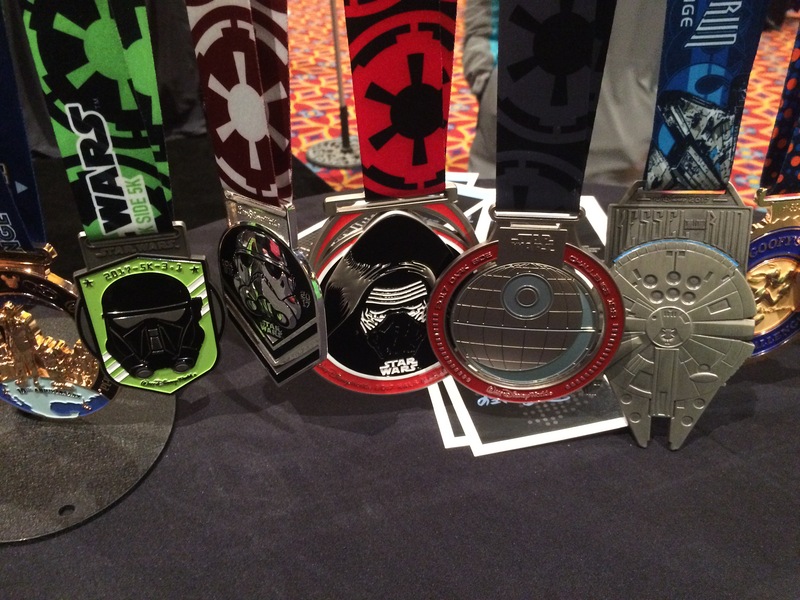 Good luck to all of you who are running at Walt Disney World this weekend and will be earning one or more of these awesome medals at the Star Wars Dark Side Half Marathon Weekend! May the Course(s) Be With You!